The New York Times bestselling author of Flight Behavior, The Lacuna, and The Poisonwood Bible and recipient of numerous literary awards—including the National Humanities Medal, the Dayton Literary Peace Prize, and the Orange Prize—returns with a timely novel that interweaves past and present to explore the human capacity for resiliency and compassion in times of great upheaval. How could two hardworking people do everything right in life, a woman asks, and end up destitute? Willa Knox and her husband followed all the rules as responsible parents and professionals, and have nothing to show for it but debts and an inherited brick house that is falling apart. The magazine where Willa worked has folded; the college where her husband had tenure has closed. Their dubious shelter is also the only option for a disabled father-in-law and an exasperating, free-spirited daughter. When the family’s one success story, an Ivy-educated son, is uprooted by tragedy he seems likely to join them, with dark complications of his own. In another time, a troubled husband and public servant asks, How can a man tell the truth, and be reviled for it? A science teacher with a passion for honest investigation, Thatcher Greenwood finds himself under siege: his employer forbids him to speak of the exciting work just published by Charles Darwin. His young bride and social-climbing mother-in-law bristle at the risk of scandal, and dismiss his worries that their elegant house is unsound. In a village ostensibly founded as a benevolent Utopia, Thatcher wants only to honor his duties, but his friendships with a woman scientist and a renegade newspaper editor threaten to draw him into a vendetta with the town’s powerful men. Unsheltered is the compulsively readable story of two families, in two centuries, who live at the corner of Sixth and Plum in Vineland, New Jersey, navigating what seems to be the end of the world as they know it. With history as their tantalizing canvas, these characters paint a startlingly relevant portrait of life in precarious times when the foundations of the past have failed to prepare us for the future. Barbara Kingsolver is the author of nine bestselling works of fiction, including the novels, Flight Behavior, The Lacuna, The Poisonwood Bible, Animal Dreams, and The Bean Trees, as well as books of poetry, essays, and creative nonfiction. Her work of narrative nonfiction is the enormously influential bestseller Animal, Vegetable, Miracle: A Year of Food Life. 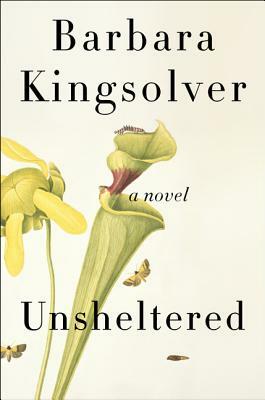 Kingsolver’s work has been translated into more than twenty languages and has earned literary awards and a devoted readership at home and abroad. She was awarded the National Humanities Medal, our country’s highest honor for service through the arts, as well as the prestigious Dayton Literary Peace Prize for her body of work. She lives with her family on a farm in southern Appalachia.